Boy Scout Troop 519 honors! Multiple Boy Scouts in Troop 519 were honored with a plethora of merit badges (54) and rank advancements at a Court of Honor ceremony held at Holy Cross Church on Feb. 28. 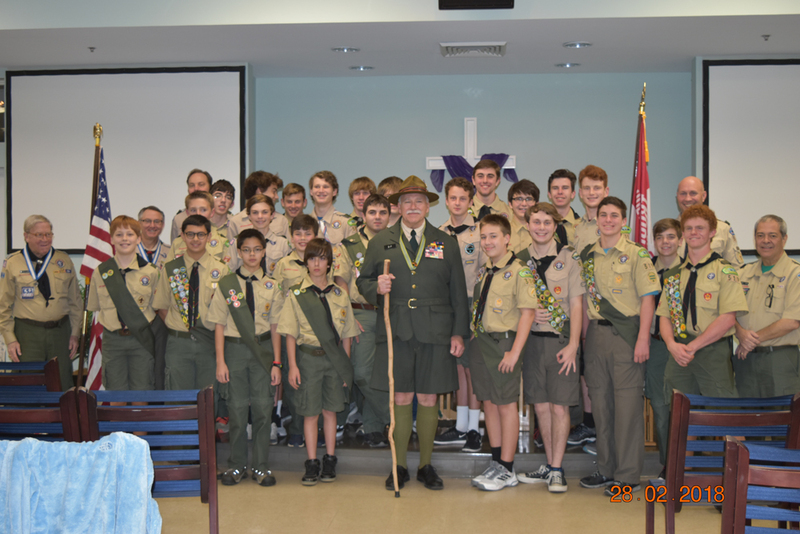 The group is pictured here with special guest “Lord Robert Baden-Powell,” who served as a guest speaker at the program. 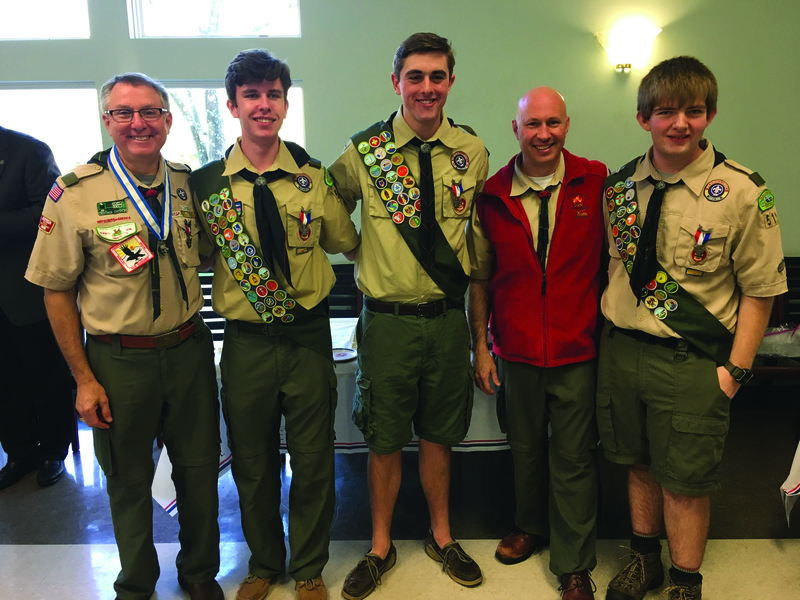 Three members of Daniel Island-based Boy Scout Troop 519 received scouting’s highest honor last Sunday, March 4. Earning the prestigious Eagle Scout Award are Edward Snyder, Cameron Kimner and Cameron Bush. Each had to complete at least 21 Eagle-required merit badges, hold leadership positions in the troop, perform hours of community service, and complete an Eagle Scout Service Project. Pictured at Church of the Holy Cross after the ceremony are (left to right): Troop Committee Chair Dr. Julian Levin, Edward Snyder, Cameron Bush, Scoutmaster Tony Duttera, and Cameron Kimner. Two leaders in Boy Scout Troop 519 received special honors recently. Scoutmaster Tony Duttera (left) received the Unit Leader of Merit Award, which recognizes quality leadership as well as the promotion of a positive image of scouting in the community. 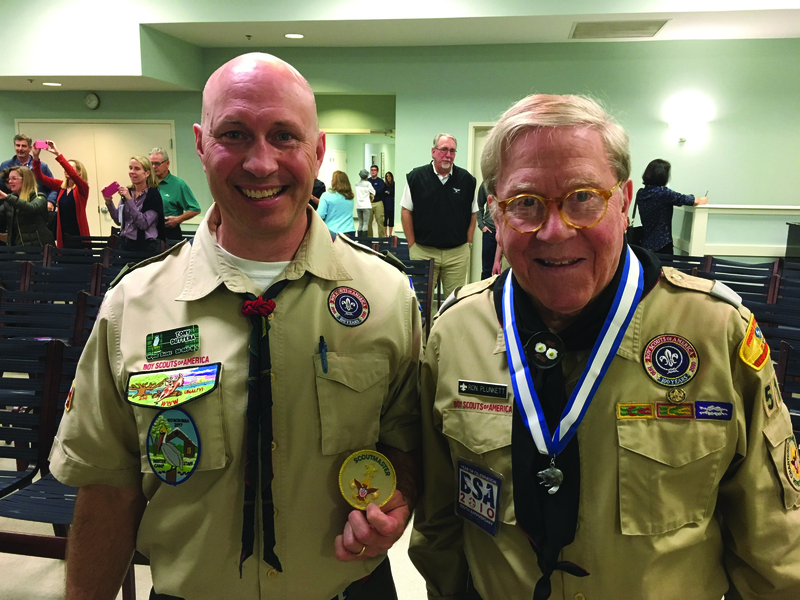 Ron Plunkett (right), a Troop 519 chartered organization representative and committee member, received the Silver Beaver Award, an honor bestowed on those who demonstrate exceptional character and those who have provided distinguished service within a council.